Number Of Social Media Users Worldwide From 2010 To 2018 #Infographic ~ Visualistan '+g+"
Social networking remains the most commonly sought online communication globally. Its growth has exceeded expectations over the last few years. Facebook remains the front runner in social media usage and currently boasts 1.55 billion online users across the world. Having launched in 2004, Facebook is expected to grow by 132 million users in 2018. Platforms including Twitter, Instagram, Pinterest and Google+ are close contenders will millions of active users growing annually. Understanding social media growth requires an investigation into online connectivity across the world. With advancements in broadband and online connections, online communication has expanded from the PC to the smartphone and tablet. It has become easier to find information on products and services and to engage with others through social media that is fast, effective and economical. Developing countries have seen increases in web connectivity and the ability to participate in social media applications. 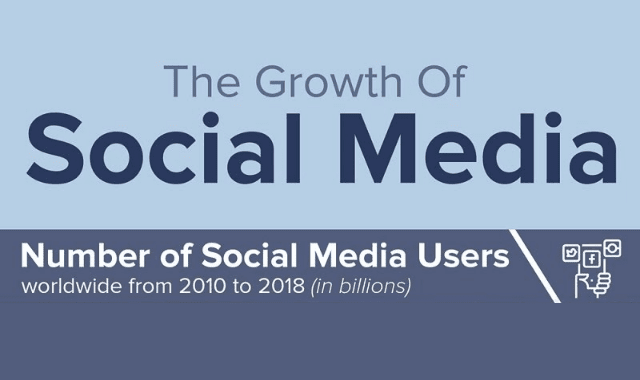 With the expansion of social media, the infographic presented by reviewwind delivers a breakdown of how social media has grown over the last 8 years and is predicted to grow in 2018. It includes comparative charts and statistics. From individual users on an international scale to faster means of connecting to the internet, more people are taking advantage of social media.